Green Book stars two time Oscar nominee Viggo Mortensen and one time winner Mahershala Ali on what would appear to be the underdog film of this awards season. The film is based on a true story of the real life friendship between Tony (Lip) Vallelonga and Dr Don Shirley. Tony is hired by Don to drive him through the southern states of America on his concert tour with his band, The Don Shirley Trio, and Tony takes it upon himself to protect Don on some of the racial battles he faces along the way. 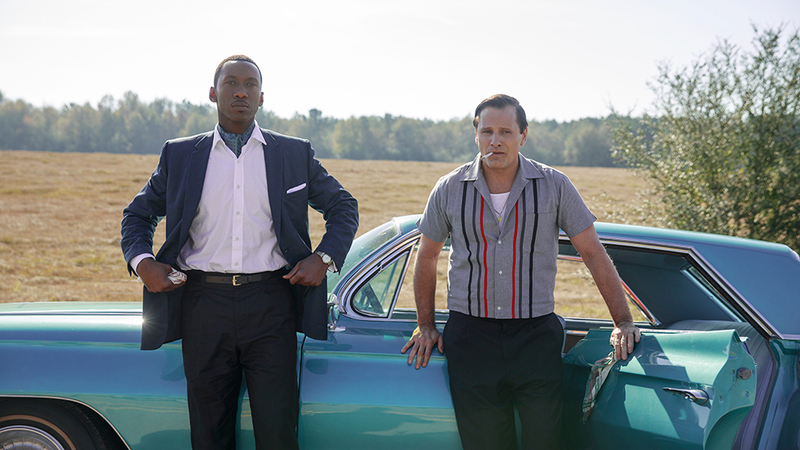 Its reception has been mixed and I'll admit I'm a little on the fence about how to feel about Green Book myself because on the whole, it's quite possibly one of my favourites of the year but I do have to question whether it does much to help such a heavily charged issue. We have seen many films this year such as Spike Lee's BlacKkKlansman and George Tillman Jr's The Hate U Give that arguably tackle race issues a little more deeply but I believe Green Book poses a new view point of identity whilst attempting to tackle racial stereotypes along the way. NYC in 1962 is where we begin our story, Viggo's character is likeable from the get go after conning the man who essentially puts him out of work. He has an air of charisma that trips slightly when he calls two black workmen in his home "eggplants" and throws the glasses they were drinking from in the bin. Casual racism is alive and well in the Vallelonga household. This is our little set up for Tony's character arc as he meets Dr Don Shirley for the first time at his job interview to drive him down South. We get a look into Dr Shirley's world, he lives above Carnegie Hall in an extravagant apartment decked out for a king with artwork and trinkets, it almost feels like a room at a museum and it's our first tip to his loneliness. The two other men in the Don Shirley Trio appear to be more like business partners than typical bandmates and drive separate from Don and Tony. The car journeys are our exposition into how opposite Don and Tony are and where their friendship starts to bloom. Tony is New York born and bred, living in the same neighbourhood he grew up in, typically struggling to make ends meet and doing dodgy deals to get by. Don is well spoken with a depth of classical music knowledge, physically uptight and put together played so beautifully by the wonderful Mahershala Ali. Both characters were cast perfectly, you can see their worlds extending off screen, there is no debate in whether the actors were right for their roles. The uniqueness in this movie is that the story revolves around the friendship and the race issues just happen to be secondary to that which is where the debate comes in to play about whether this movie's narrative is slightly confused. You can see Tony has a genuine respect and admiration for the work of Don and their friendship and the comedic elements are what this movie thrives on but there simply is not enough blame for some of the actions taken against Don by the white people of the South. Although the story is based on true events, I would like to know if some of the events played off as neatly as they did in the film. The further down he gets the more challenging it is. The most poignant and centred scene is the fight between Don and Tony where Mahershala Ali really lets Don's composure slip. His line "So if I'm not black enough and if I'm not white enough what am I?" is what the narrative should've gripped tighter to. Ali has a wonderful way of using his eyes to say something entirely different to the words coming out, you can tell he understands the nuances of his character so fully. Whether it handled all the themes it set out to tackle is up for debate but I enjoyed this movie for the wonderful performances and the comedic moments. Both Mortensen and Ali did their characters justice and their on screen chemistry was electric and alive, they bounced off each other perfectly which I don't think could've been done by any other actor combination. The story is heartfelt and warm and a brilliant exploration of unlikely friendship. It takes you inside their road trip and lets you feel every emotion they feel. I've seen this film twice now, in rooms with two different audiences. One would be considered the casual moviegoer and the other was a room full of people in the media. The jokes landed harder with the casual moviegoers (I haven't heard a screen full of so much laughter since I saw Lady Bird back in February) but the media applauded it at the end. Nevertheless, Green Book has scooped up 5 Golden Globe nominations and I believe will mirror that success at the Oscars. I'd like to see both actors rewarded for their performance. Green Book hits UK cinemas February 1st 2019.